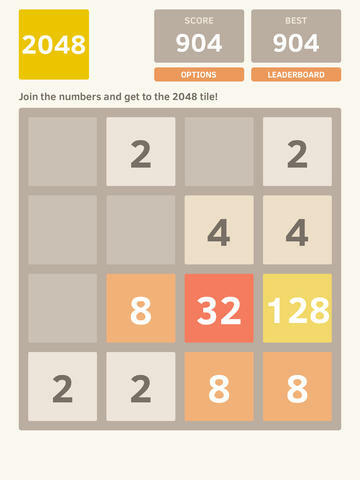 2048 took the web by storm when it debuted last month. Created by 19-year-old Italian web developer Gabriele Cirulli, the sliding numbers game challenges you to combine tiles and build a tile with the number 2048 before you run out of moves. It sounds easy in theory, but it is incredibly challenging. The popular web app was ported to iOS and a version of the game by ketchapp has become an instant hit, climbing to the top of iOS App Store. 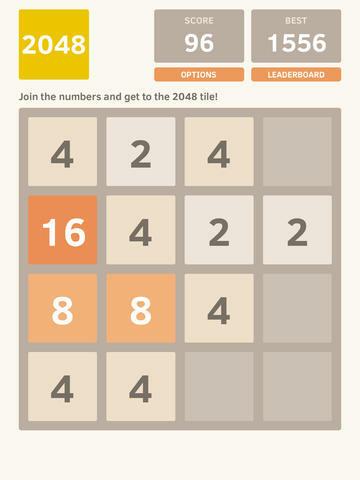 The 2048 app adopts the same appearance and challenging gameplay of the web version. 2048 gameplay is simple and reminiscent of Threes!, a similar sliding numbers game. You have a 4x4 grid of number tiles based on the number 2 that you combine. You can only combine tiles with the same number, a 2 tile with a 2 tile, a 4 tile with a 4 tile and so on. As you combine tiles, they are combined into one tile, their values are added together and another tile appears on the screen. You keep adding tiles until reach 2049 or your screen fills up and you can't move anymore. I've been playing 2048 and I've not been able to crack 128. I'm not the patient type with strategy games and end up randomly combining tiles until I can move anymore. There are online strategy guides for 2048 if you want to beat in style. The 2048 game by ketchapp is available for free from the iOS App Store. It is compatible with the iPhone or iPad. The app includes ads, but they do not interfere with the gameplay. Daily App: 2048 by ketchapp is a perfect port of the popular web-based numbers game originally appeared on Breaking Apple News, Tips and Reviews from The Unofficial Apple Weblog on Fri, 04 Apr 2014 09:00:00 EST. Please see our terms for use of feeds.